Leaving Quebec in June, the northern British army's commanding officer Major General John Burgoyne was confident in his ability to strike a decisive blow against the rebellion in the colonies. Instead, the stubborn rebels fought back, slowed his advance and inflicted irreplaceable losses, leading to his defeat and surrender at Saratoga on October 17, 1777 - an important turning point in the American Revolution. 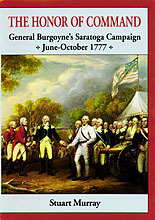 Burgoyne's point of view as the campaign progresses is expressed from dispatches to Lord George Germain, British Colonial Secretary, addresses to his army, and exchanges with friends and fellow officers. Maps, sketches, engravings, and contemporary portraits depict the Lake Champlain-Hudson River Valley corridor from St.-Jean's to Saratoga; General Burgoyne, individual uniformed soldiers, the Baron and Baroness von Riedesel, and the death and burial of Simon Fraser. Index. Ordering Information: 7" x 10"; 128 pages; Numerous illustrations and maps; Index.